Collins Hill High School has established itself as one of Georgia's elite wrestling programs. The Eagles have finished in the top ten in Georgia's largest classification fifteen consecutive years, including top 3 finishes each of the the last eleven years and State Titles in 2001-02, 2004-05, 2007-08, 2008-09, and 2009-10. The Eagles have also wrestled to Region Championships 11 of the past 14 seasons. In sixteen years of existence, the history of the program includes an impressive array of individual achievements. Eagle wrestlers have placed (top six) 123 times in the State Tournament, including 33 individual State Championships. 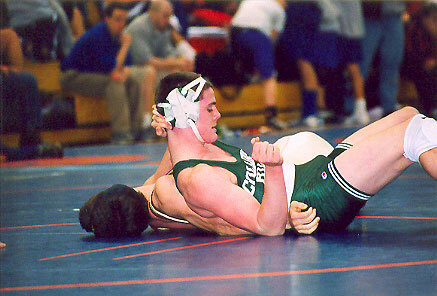 In 2005 Tyler Parker became the first wrestler in AAAAA history to win 4 Individual State Championships. Also, five former Eagle wrestlers, Joey Guiler (class of 2000), David Brunson (class of 2001), Taylor Knapp (2009), TJ Mitchell (2010), and Bazell Partridge (2011) won 3 State Championships during their careers. Nick Lukacs (class or 2004) and Joel Smith (2010) finished their careers with 2 State titles and three finals appearances. The Eagles' 2009-10 season qualifies as perhaps the best in Georgia history. Collins Hill was crowned both Dual Meet and Traditional State Champions for the 2nd consecutive season. Strong showings in three national-level tournaments in Kansas City and Pennsylvania resulted in a top-10 ranking nationally. Additionally, Collins Hill tied their own record from the previous season by sending twelve wrestlers to the podium at the Georiga State Traditional Tournament, including 6 State Champions. Seniors Joel Smith and TJ Mithcell solidified their place as all-time greats by winning their 2nd and 3rd State Titles respectively. Despite the loss of an outstanding senior class, the 2010-2011 team, led by Coach Stephen entered the season as the #1 ranked team in Georgia with a very tough schedule ahead of them. The Eagles won titles at the Alexander Duals, Cleveland Duals (TN), Midwest Classic (MO), Kyle Maynard Duals, and both Region 7 Championships. The team also finished 2nd to Brandon (FL) at the Cougar Invitational (FL) and had strong showings at the PowerAde Invitational and Final Four both in Pennsylvania. The season ended by winning both the Georgia Dual and Traditional State Championships with another record 12 placers and 7 finals. Sean Russell and Bazell Partridge won state title with Partridge winning his 3rd in a row. The 2011-2012 season looks to be another great one with an even tougher schedule as the team travels to Florida, Ohio, Missouri, Pennsylvania (2x), and Wisconsin. Collins Hill has 6 returning state placers and a host of others to fight to repeat and make it 5 state titles in a row.